I think it’s safe to say that most of us love Pottery Barn. However, for many of us Pottery Barn is a bit too pricey. 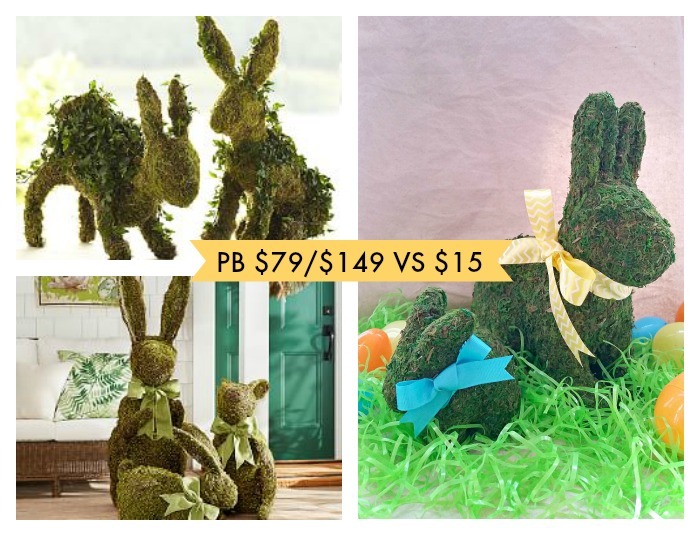 So, when I saw their live ivy topiary bunnies at $79 and twig bunnies for $179 (very large bunnies), I knew I there had to be a less expensive alternative. My less expensive version is a cross between the two Pottery Barn bunnies with a much lower price tag. The only downside is that this is a VERY messy craft*. You will be covered in moss bits and will need to break out your vacuum cleaner or broom after this project is done. *If you are highly sensitive to dust or have respiratory issues, you may want to use a mask for this project. Make sure to use craft store coupons to save the most money on this project. Gather your supplies. 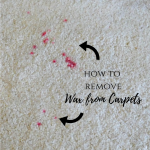 Unwrap the roll of moss mat and remove any paper backing that remains on the back. 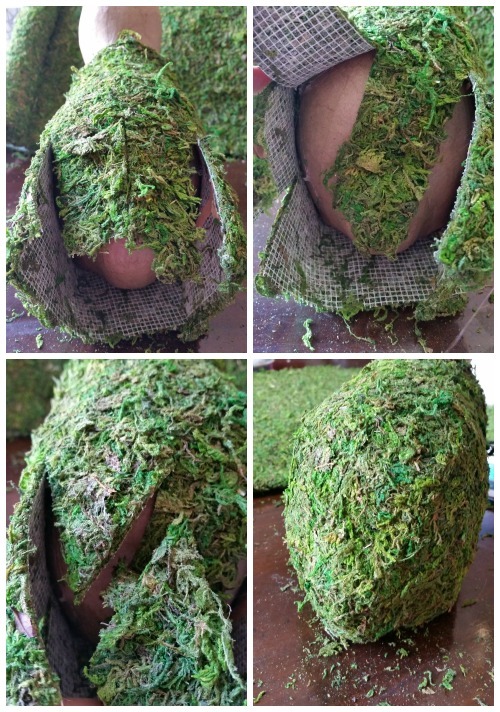 Cut a strip of moss that is large enough to cover the back of the bunny from the neck to the bottom of the bum. I cut my sheet about 6.5 in. x 18 in. Glue* down the moss in sections. I started from the top of the back and worked my way down the sides and back. *Don’t use too much glue or it will seep through the moss. Use just enough to hold the moss mat down. If glue does start to seep through, use the moss bits that have fallen off to cover any glue that has seeped through. 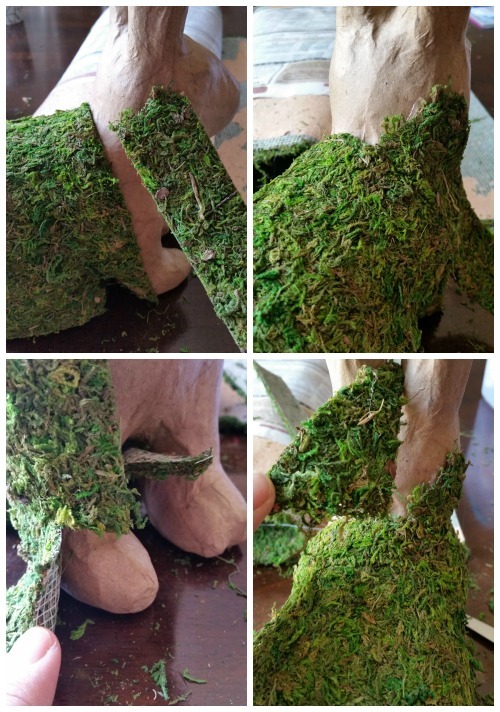 When you get to the legs or any angles, cut a slit in the moss. Don’t worry if you end up with odd shaped moss areas as this can easily be covered. 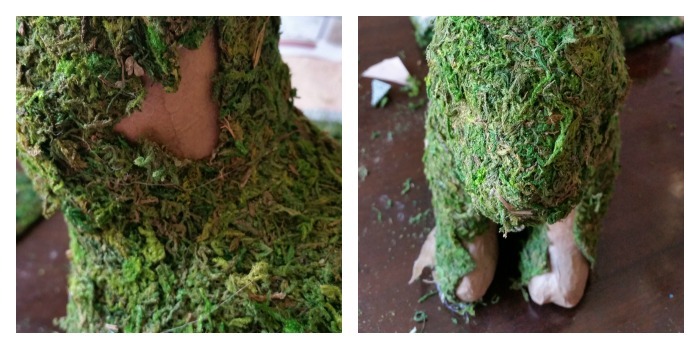 The main thing is to be able to wrap the moss around the bunny and glue it down. Here are more pictures of how I covered the back of the bunny. Make cuts in the moss mat where you want to fold down and wrap around your form. Again, don’t worry about odd seams as the seams will not show once the moss mat is glued into place. Oh, and you see those tiny bits of moss that have fallen off? These are the bits you want to use to cover any glue that may have seeped through. Just grab a pinch and smash it down into areas where you feel glue coming through the moss mat. Also, don’t throw out any moss mat scraps because you will need these to cover other areas on your form. 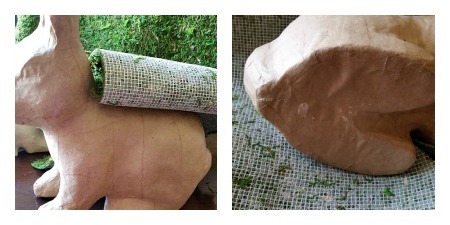 To cover the neck and front legs, I used a long 1.5 inch piece of moss mat. Again, cut the mat in areas that are rounded and curved to allow the mat to fit. I also used scrap pieces of moss mat to cover the odd shaped areas behind the neck. 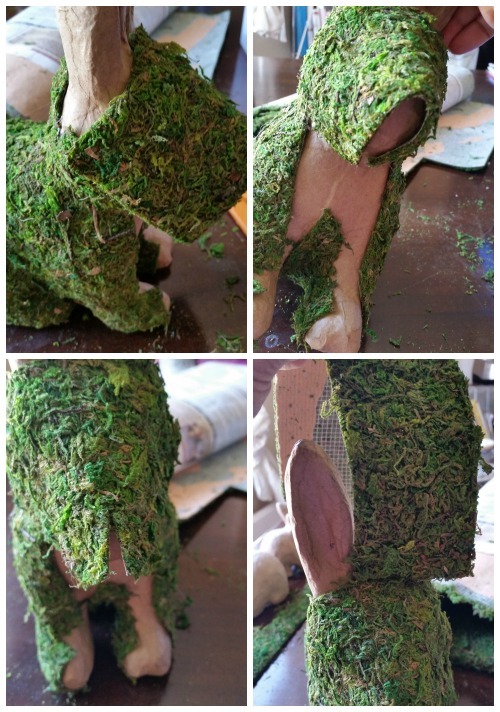 Continue to cut pieces of moss to fit around the face and ears of the bunny. Glue these pieces down. 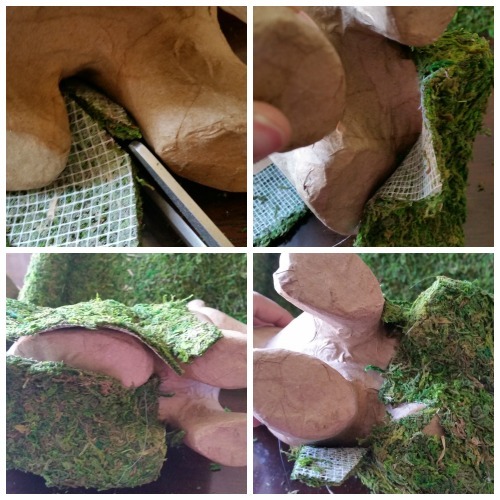 Once the majority of the bunny is covered, there will be small areas that will need to be patched with the scrap pieces of moss mat. Cut pieces to fit into these areas and glue down. Optional – spray with a clear acrylic spray to help prevent shedding. Cut ribbon and tie around the neck of the bunny. Optional – Apply fray check to the cut end of the ribbon to prevent fraying. 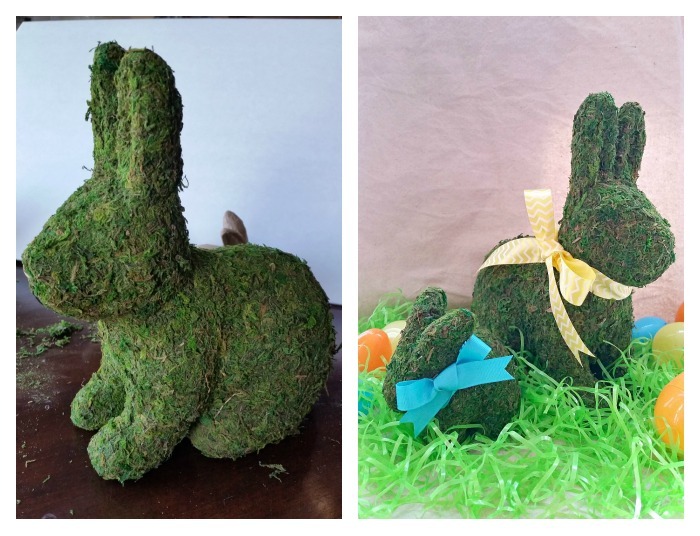 Now dust yourself off and enjoy your new moss covered bunny! 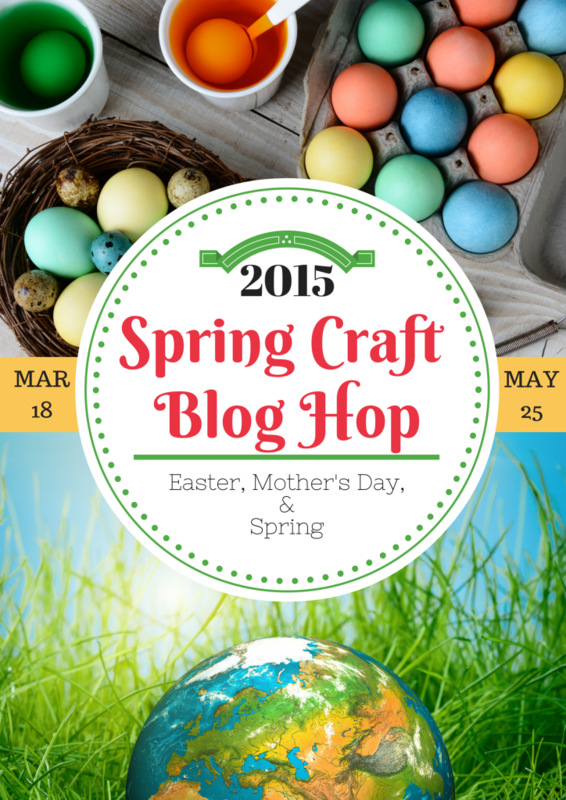 If you would like to see more spring crafts, visit the Spring Craft Blog Hop for craft inspiration. I love these! Such a cute idea and waaay cheaper to make them yourself. Pinned. 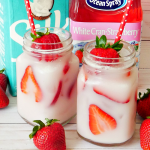 Adorable need to give this a try. I love these bunnies! I will be featuring them at Idea Box link party this week 🙂 Thank you for sharing! Thanks so much for sharing. Will be at the party! I love these. They came out great. Thank you so much for sharing at Sunday’s Best Link up. Always honored to be featured, thank you! Thanks for the invite. Will head over to link up. I absolutely love how your bunnies turned out!! They’re perfect for Spring 🙂 Thanks for sharing at Creative Spark last week; I’m featuring your moss bunnies today. Please stop over to grab a “featured” button and link up with us again! Thank you for the fun party and feature. Will make sure to come over and link up. Glad you like the tutorial & thank you so much for pinning! You’re bunny is adorable. I think it looks better than the Pottery Barn one. I love Pottery Barn, but the decor is pricey. Thanks for sharing on Small Victories Sunday link up. Such an adorable projects! Thanks for the idea. My kids would love to do it. 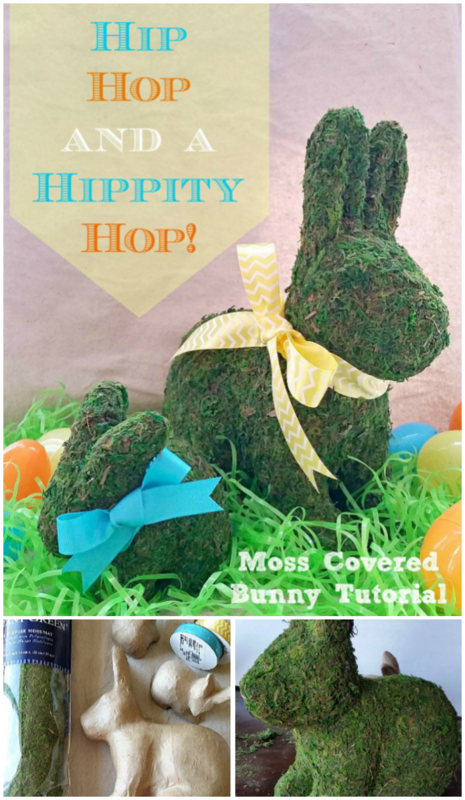 Thank you for sharing your moss covered bunny at The Pin Junkie. 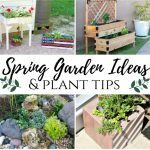 It’s being featured today in a spring and Easter round up. Thank you so much! Love your party and it’s an honor. Wow, Erlene. You NAILED IT. I think they are a 10 out of 10. Honestly. I am going to hunt for some faux moss. Great share! Thank you for being a part of our party SHARE IT one more time, Saturdays. It wouldn’t be a party without you! Have a great week! Thank you! 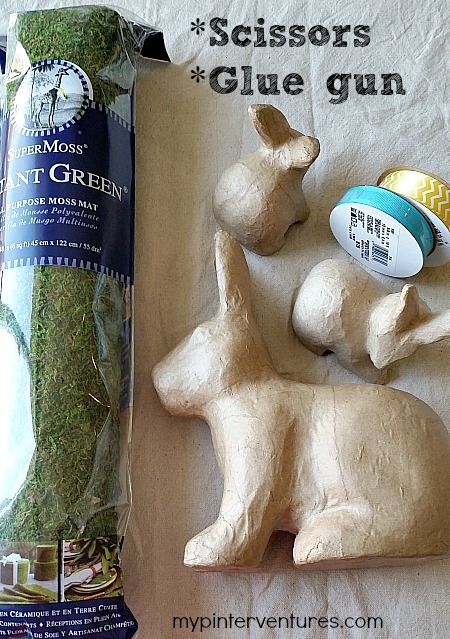 It’s pretty easy to find moss and I found the bunnies at JoAnn’s craft stores in their Easter section. Very cute! I love knocking off PB because I ain’t paying those prices but I sure love their style! Thanks Lara. Isn’t it great when you can make something you love and save $$$! I love these! I have seen a few moss crafts but never done them. I guess the moss is freeze dried, right? So they will last more than 1 year? Pinned and scheduled on FB. I’m not sure how the moss is preserved, but it will definitely last more than one year. Stopping by from Sunday’s Best. The bunnies turned out adorable and a big saving too. I love DIY projects that look just as good as the original version. Thanks for sharing! Thanks for the fun party and for stopping by my blog. I love this idea! Pottery Barn can be so darn pricey and you’ve done a brilliant job recreating it ! Thanks Zakkiya. Yes, PB is a bit pricey for me, so I love recreating items from the catalog when I can. 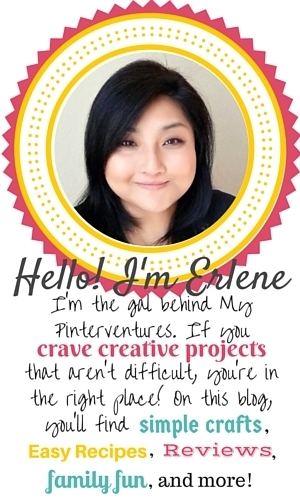 Love this Erlene and have always wanted to do! Pinned! You should try making one 🙂 It would go well on a table with all your lovely food. Thanks so much. Yes, definitely cheaper and I like that….lol. Erlene, these are beautiful! I thought for sure it would be better to use just regular moss (what a mess) but you can’t even see any seams here! So pretty. Thanks for sharing. I will be off to buy some moss! Thanks for the lovely party and allowing me to share. Erlene, your looks better than PB!! Love these. 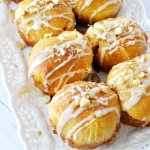 I was already planning to make the basket I featured at Merry Monday a couple weeks ago, now I want to make these too! 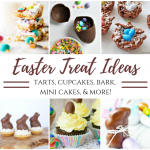 I love all these wonderful ideas, especially when they turn out this nice! Great job Erlene!! Not sure I would have the patience for that moss..Love those bunnies! 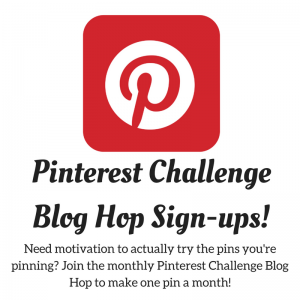 Thanks so much for pinning to the P3 Party Board! You are being featured on my blog & social media tomorrow! Thanks so much for the opportunity to pin to your board 🙂 Looking forward to seeing all the other features too. Omgosh this was so messy it was kind of funny. I was literally covered in moss bits…lol. 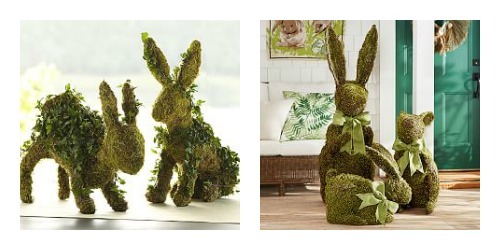 Your moss covered bunnies are simply adorable. I think I like yours even better. I made a moss covered wreath once and it was messy, but in the end it turned out great. I’m going to try my hand at making your bunnies. So cute!! These would look so cute on your Easter tablescape surrounded by your PEEPS bunnies. Erlene, I love these, what a great knock-off! That is adorable!! 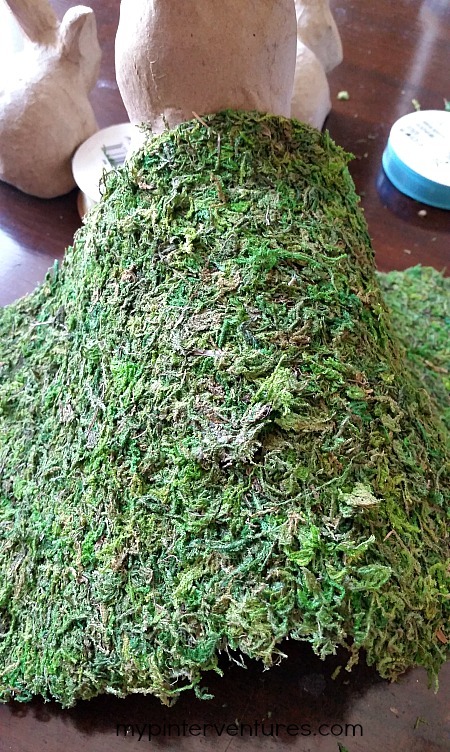 You could probably use spray glue and then the moss that’s in a bag, too. Love it!! I thought about that, but I didn’t want to mess with spraying glue and loose moss…lol. I love your moss bunny! Adorable! I love this craft! Love how you were able to do this for $15. 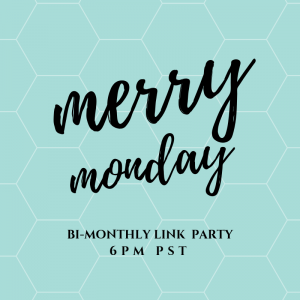 Happy to co-host this blog hop. Thanks! Joann’s had a great sale and I was able to use coupons on top of the sale 🙂 I went back to get more and someone wiped out the entire bunny section….lol. I love your bunnies, Erlene! They remind me of the year my uncle took me to NYC for Easter. The shrubs at Tavern on the Green were shaped like bunnies! 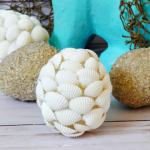 🙂 It’s so great being a part of the Spring Craft Blog Hop! You could totally do this yourself. It’s kind of crazy how expensive moss covered things are. Erlene – What a great project! 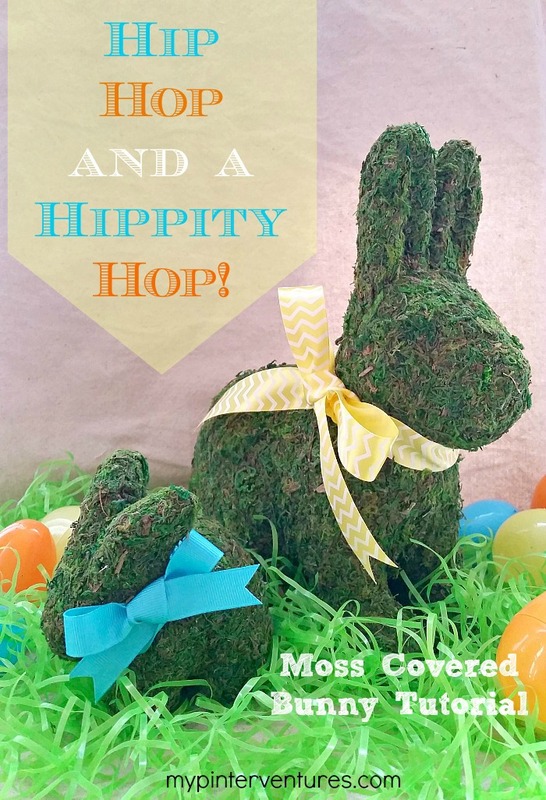 Your moss covered bunnies are so adorable! 🙂 Thank you. I love them and they have a new home on our mantel.